Watford have signed West Brom striker Nathan Ellington for a club-record £3.25m fee that could rise to £4.25m depending on appearances. The 26-year-old former Bristol Rovers and Wigan frontman has signed a four-year deal at Vicarage Road. Ellington had handed in a transfer request at The Hawthorns in January. Baggies boss Tony Mowbray said: "We are getting an excellent fee for his services - this deal is right for both the club and for Nathan." 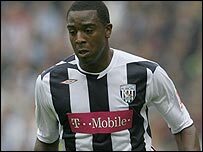 Ellington scored 20 goals in 91 games for Albion but was unable to displace Kevin Phillips or Diomansy Kamara for most of last term. "Nathan became frustrated at the lack of starts he was getting in the team and expressed a desire to go and play regularly elsewhere," Mowbray added. "It was well documented during the January window that Nathan wanted to leave the football club. "But, when a transfer didn't materialise, all credit to him for getting his head down for the remainder of last season. "Another opportunity has arisen for him to leave and Nathan expressed a desire to take up that opportunity."